When I was contacted by Game Farm to sample some of their fine quail products, I quickly jumped on the opportunity because I love the flavours of the little birds. Game Farm’s produce is HACCP and halal accredited and as the largest multi-species game bird producer in the Southern Hemisphere their retail range includes duck, spatchcock and a variety of delicious quail products, in addition to a number of other birds available by direct order. Considering my recipe options carefully, I had decided to go with two dishes which I think showcase the simplicity with which the breasts are cooked while highlighting the complexity of flavours of this gamey meat. The first, sticky braised quail breasts with fried quail eggs, is an Asian inspired dish full of five spice aromas and a sweet flavour from the sticky glaze. The quail breasts are braised to keep the meat succulent and infuse all those wonderful flavours into the fillets. The eggs, tiny as they are, a fried sunny side up until the whites are crisp around the edges while the yolks remain runny. It’s a perfect dish for more formal affairs. My second choice, Scotch quail eggs with lingonberry jam, was inspired by a recent visit to District Dining where Warren Turnbull’s team churns out one of the best appetizers ever, the crispy quail egg ($14). My version, however, consists of quail breast mince in which the egg is encased and lingonberry jam (from IKEA Food) to complete the gamey, forest inspired dish. While I tried to keep the yolks soft, between the short boiling time and then frying off the mince rolled eggs, they did harden. Nevertheless, I think it was a better outcome considering the saucy nature of the jam which would have clashed with the runny yolk. These were my favourite, wonderfully moist and great as finger food. Now it’s not often that I get to enjoy quail in the comfort of my own home, mainly because Mr Chipconnoisseur is yet to warm up to the flavours of game. One day he will get there, I’m sure, but for now the indulgence is all mine to keep. Because they are tiny, braising quail breasts in a fragrant, Asian-inspired liquid helps the meat retain moisture and infuses it with wonderful aromas of warm herbs and spices. Leave the skins on to keep more moisture sealed in. Serve with steamed or garlic fried rice. While I left the seeds in my chilli to accentuate the spice, feel free to deseed your chilli first. To make the marinade: combine all ingredients in a bowl large enough to hold the breasts as well. Mix well until the sugar dissolves. Add quail breasts and marinade for 1-2 hours. To braise the quail breasts: place marinated breasts along with the marinade into an oven-safe dish or tin, spreading them out into a single layer. Cover tightly with aluminium foil and braise in the oven for 25 minutes. Remove from oven, transfer into another bowl and leave to cool, reserving the braising liquid. In the meantime prepare the sticky sauce. To make the sticky sauce: place strained braising liquid and brown sugar into a small saucepan and heat over small heat to reduce to a warm honey-like consistency. Keep an eye on it as you don’t want it to burn. When it’s ready, add braised quail breasts, smother them in the sauce and allow them to warm through. In the meantime, fry the eggs. To fry quail eggs: use a large pan so that the eggs won’t stick together. Heat 4 “patches” of peanut oil in the pan over medium high heat. Break quail eggs into each spot and fry, sunny side up until crisp eround the edges, the whites have set but the yolks remain runny. To serve: place sticky quail breasts on top of steamed rice, add fried eggs as a side and garnish with some chopped chives and coriander leaves. I think traditionally, Scotch eggs are made with a mixture os sausage and regular mince. For mine, I used Game Farm‘s quail breasts to make the mice. Lingonberry jam can be easiest found at, out of all places, IKEA Food. When frying the “meatballs” stand back a little or use a splatter guard as the oil may spit around because of the water content of the marinade from the Worcestershire sauce. To cook the quail eggs: place eggs in a small saucepan filled with lukewarm water. Bring to a boil, and cook for a further 90 seconds. Drain and place in another bowl under cold running water for a couple of minutes to stop the cooking process. To peel, roll the egg around gently on the benchtop. Store in the fridge, covered, until ready. To make the quail breast mince: process skinless quail fillets in a chopper attachment of your stick blender or in a food processor until almost smooth. Add Worcestershire sauce, Italian herb mix, pepper and a teaspoon of peanut oil. Mix well and allow to marinade for at least 2 hours. To make Scotch quail eggs: place breadcrumbs into an easily accessible bowl. Divide the mince into 5 even quantities. Using one hand (I’ve found gloves help) and a spoon, flatten the mince gently, push a quail egg into the middle then wrap the meat around so that no egg is visible. Drop into the breadcrumbs and roll around to cover. Repeat with the rest. To fry: place enough oil in a small saucepan to come about 1cm up the meat balls. Heat oil over small heat until very hot but not smoking. Using tongs, place heatballs gently into the pan and cook for about 20 seconds on each side, plus any parts that may not have browned. Remove from the pan and drain on some kitchen paper. 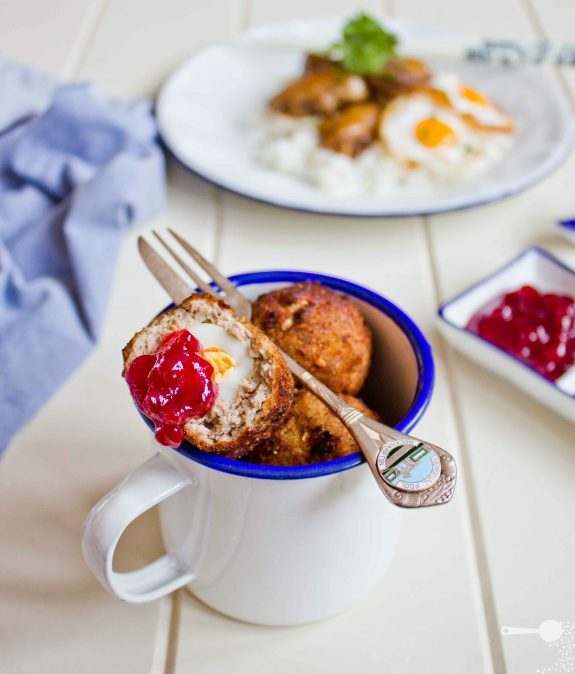 To serve: arrange warm Scotch quail eggs on a plate and serve with a little bowl of lingonberry jam for dipping. I have never made scotch eggs… for some reason I’m mildly scared of them, but you make them look not so scary… I might give them a go!!! Love the styling you’ve done for this. Scotch eggs remind me of home, but I would have never thought of making them with quail eggs AND breast meat, They look amazing, will have to try. 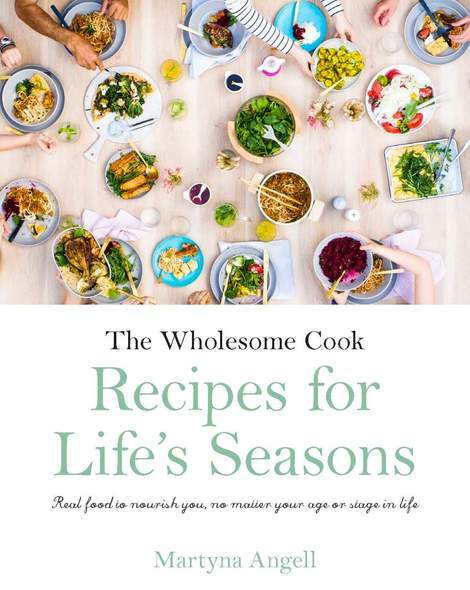 This looks really lovely. I love the photos! Cute Scotch eggs! I used to eat quail eggs all the time back home, you can find them in every supermarket. Haven’t had any in Sydney yet. Wow! I haven’t been to your blog in ages and look what I’ve been missing. Both dishes look perfect and they are definitely getting bookmarked. Can you tell me where I can get Game Farm products from? Thanks heaps! Hi Anne, welcome back! You can buy Game Farm’s produce from many of the large supermarkets as well as Harris Farm and many of the butchers around. There is also a “Farm Door” which is open daily till 3:30pm in Galston. Enjoy! You have inspired me to start making my Scotch eggs again, yours look great and I love the Lingonberry touch! Beautiful photography today. I’ve never made Scotch Eggs either, they always sounded sort of “mysterious”… now they’re looking doable! I’ve never attempted scotch eggs, definitely wouldn’t mind hard yolks. Game Farm have gorgeous produce. I have never tried to make sctoch eggs before and using quail is a great idea. Quail! I have never cooked quail or quail eggs, but would LOVE to. Very gorgeous photos! What a beautiful and different dish! This looks very delicious and like nothing I’ve ever seen before. I’m glad I found your blog! Thanks for sharing. both dishes look delicious! I love quails’ eggs they taste so different from chicken eggs, more tender and rich. very interesting to pair it with lingonberry jam, haha i love that stuff. Both dishes look gorgeous! I have been meaning to make Scotch eggs for ages because I simply am sure I will love them even though I have never tasted them. Quail eggs would be even better and cuter. Otherwise, I cannot take my eyes off your chopsticks. They are beautiful and very original. Oh Martyna! This is a beautiful recipe. I have some Game Farm quails in my freezer and this is just the inspiration I need. I made a quail egg salad a few months ago. I found them a nightmare to peel (boiled) while still keeping them intact. Any tips? Oh and the District Dining eggs … swooooooon!! Thank you Sneh! I’d say chill them really well, then crack and roll gently all over under your hand, until the shell is in pieces. Then peel gently from either top and take your time. Out of 5 eggs, I only had a tiny issue with the first! Two very different, but very delish looking meals! I’ve always wanted to try quail eggs. Wow Martyna, this dish sounds brilliant! I am loving the addition of eggs with chicken and rice in Asian dishes lately so I imagine the quail would be great! Gorgeous & amazing! Both recipes are to die for. I’m in love with the scotch quail eggs idea, it’s something that I’d love to try over the weekends. They’re meant to be served cold, but I think a little warmth would do these babies good! The idea of quail mince is perfect, since the meat is gamey and stands up in its own right when it’s minced and wrapped around an egg. Yes yes this scotch eggs has been my one of to-make list for a long time. I keep forgetting about it but I have been wanting to make. I like dish that has eggs in it (today’s recipes are two thumbs up!). Thanks for sharing the recipes!